The first question may or may not be easy for you since its a contested term, but I wonder if you see yourself as a ‘feminist’ artist? I am writing about the re-positioning of art created by women from the 1970s/80s in comparison to now. I’m interested in whether you feel it is necessary or not to define yourself as a feminist? Yes, I would call myself a feminist artist. I think it’s necessary to define myself as a feminist artist because it’s a way of acknowledging the major gender imbalance in the artworld (male artists are overrepresented), and the sexism at play there (male artists continue to be selected for shows more often than female artists), and the world in general (where do I start!). As I get older, I appreciate more and more how much more difficult it is for female artists to get a break. We also live in terribly superficial and youth obsessed times, and it’s necessary to stand against this by just being yourself and being great at what you do. I am thinking of people like Patty Smith and Louise Bourgeois here, who were/are just themselves. Actually, my mother is very much this kind of woman, although she worries about getting old. I wonder how far you feel in control of your audience? Do you intend that they help you construct your own ‘autobiography’ ? Yes, my work is about my own ‘subjectivity’. But I am an artist, and it’s obviously not just a ‘dear diary here is my life’ outpouring. My work is extremely calculated. I think about it a lot before it happens. I consider my work very much from the perspective of the audience. I want them to get a certain ‘feeling’ when they see my work. I want them to feel like they’ve lived through whatever I’ve lived through themselves, whether they are man or woman. For example, ‘Film for my Nanna’, where I am the bride without a groom walking the streets, everyone could relate to that picture of loneliness. And in my live 2 month performance in Sydney last year at the MCA, ‘ The Reliving Room’, I wanted people to feel sympathy and shame for me dancing, but I also wanted them to be amazed by my physical proximity. I wanted to create a sort of appalling, yet entertaining and compelling, atmosphere. *Regarding audiences, the one thing I don’t want them to be is bored. I think the idea that art is somehow ‘outside’ your own feelings and emotions and preferences is silly. In a sense, every artist makes work about themselves. My father made small white pastel paintings to ‘make work about nothing’ (he doesn’t like feeling strong emotion), and my mother makes work about the ideas of philosophers she loves, using domestic materials and plaster. I am social and crave an audience, so I try and make my work really accessible by using simple ideas, text and actions. I’m very pop. I think if anything, I’m immature. My emotions are still interesting to me. People’s emotions interest me. I see emotions as being grounds for art. I have long had a sense that I am growing up in art via my art practice. Back in 2006, I was in high adolesence and now I am moving out of that period. There is a lag between my actual age (35) and my art age (23). Maybe one day the gap will close and I will be a boring adult and make ultra aestheticized pretty yet bland art. I notice that Julian Engberg states that you are not really a ‘victim’ because you control your own situation so precisely. But I wonder what control you think you have over the viewer’s speculation about you when they view your work? I really don’t think I portray myself as a victim in my work, as my work is about me getting over something, turning emotions into art, transcending the crap of life. Infact, watching art by someone who really does represent themselves as a victim is very uncomfortable and actually quite unappealing and repellent. In my work, I take my ‘victimness’, or ‘low level suffering’ to a point where I own it and I say ‘yeah so what’ and I get a chance to have my say. In art you can do anything, including redressing perceived wrongs inflicted upon one. Seriously though, if I am described as setting myself up as a ‘victim’ in my work, people need to take a look at the use of the word ‘victim’. What sort of ‘victim’ gets to transform their sad/lonely/heartbreaking experiences into art that is light and hopefully funny and redemptive and has an audience? I am the maker of work about myself and I call the shots, as it were. Do I feel in control of my audience? I don’t think in terms of control. Technically, I know they can do anything to me in live performance, and things can go wrong. But usually I have a sense of where people are at and how they are likely to respond – actually, this is not true. I guess I have a sense of how I can ‘influence’ people with my work, or connect with them, certainly in my video work. But really, it’s not about control. I like risk and I like doing things which are uncomfortable. I must have an element of risk in my work otherwise I don’t feel like myself. I guess if I feel like I’m not offending someone, I’m doing something wrong. I always have to go further, push an idea further to the point where I am scared to do it. Art takes so much courage that sometimes I get physically ill during installation time. So basically, the audience is both irrelevant and so relevant it’s terrifying. Every artist feels that, I’m sure. Ultimately though, if I believe in my idea and I am in the process of developing it, what the audience thinks about the work doesn’t matter. I am compelled forward! I’m also interested in your use of familial relationships in your art – working with your mother and referencing your Nanna. I found a YouTube interview with you talking about how important your relationship is with your mother. Is your referencing of family ties a conscious decision? I wonder how you feel about it in relation to much earlier work such as Hannah Wilke’s ‘Portrait of the artist with her mother, Selma Butter’? Basically, the reason why mum is around my work: my mum is very intelligent. I can’t hold a candle to her. i love the way she talks about art, about her work and my work. She really understands what I do. I used to worry what she thought about my work, now I feel more confident in my work and don’t worry as much. But her opinion means a great deal to me. I wasn’t aware of Hannah Wilke’s portrait of her mother. I will have a look and get back to you about it. 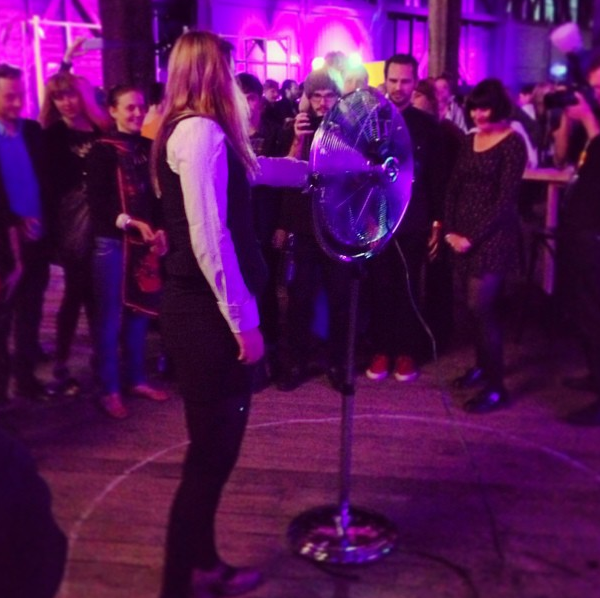 An evening in which I threw my $500 artist fee away to strangers in the space of five minutes. After my initial project for Parlour was pulled due to OH and S concerns, I was keen to do something quick, easy and effective that would have no problem passing through the censors. So I decided to give my artist fee away as a performance. 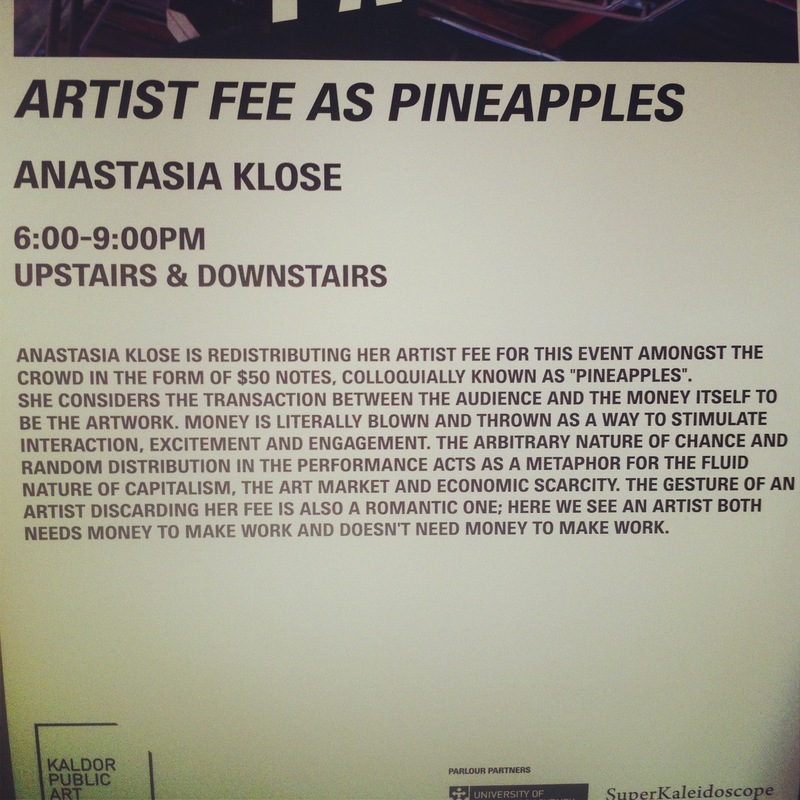 While I threw five $50 dollar notes at strangers with a fan blowing behind me, my accomplice, Jodie Franco, moved around the parameters of the crowd and handed out the remaining five $50 notes to strangers, stating “This is a gift from the artist Anastasia Klose”. When individuals expressed confusion at being given $50 randomly, Jodie soothingly instructed people to take the money and enjoy it. By the end of the five minute performance, ten $50 notes were handed out. It’s nice to be given money by a stranger and it practically never happens. People are seemingly unwilling to take money as limits of protocol and proprietary are tested – the uncomfortable feeling of taking free money conflicts with the lovely feeling of winning or being chosen. While the banners for the Commonwealth Bank hung behind me in the giant barn of pier 2/3, I was giving it away. It was a funny, moving and strangely polite performance. Thank you to Jodie and Heath Franco and to all those who looked on.